The Senate overwhelmingly approved a House-passed bill 95 to 3 Wednesday that would unwind $6 billion in cuts to veterans benefits from last year’s budget deal that proved to be a political fiasco for all involved. The conclusion of the battle to unwind the cuts in Congress culminates several days of flip-flops from Democrats and Republicans. Lawmakers ultimately concluded it was shrewder to put to rest a rising political vulnerability with veterans than continue petty-looking squabbles over offsets that are lost on the public at large. The takeaway message from the massive backlash over a relatively small-dollar provision included in last year’s budget agreement engineered by Wisconsin Republican Rep. Paul Ryan is don’t mess with vets, especially in an election year. The legislation that now heads to President Obama’s desk for his signature, would pay for restoring a 1 percent cost-of-living adjustment to military retirees’ pensions by extending the mandatory sequester cuts an additional year. Senate Democrats had spent much of Tuesday insisting that it was imperative to pass a “clean” bill without an offset ASAP, arguing that veterans had already “paid in full” their debt to society, even though none of the offsets being discussed would have touched other veterans benefits or even come out of the Department of Defense. They were pushing a bill that was pending in the Senate from embattled Arkansas Democrat Mark Pryor that would have unwound the cuts without paying for them. But between the House’s undeniably overwhelming vote on its bill Tuesday of 326 to 90 including 120 Democrats, and the inability of Democrats and Republicans to agree on amendments to the Pryor bill, Democratic leadership abruptly changed course Tuesday scheduling a vote on the House bill. A few hours ahead of the vote, Democrats appeared to be caught off guard. 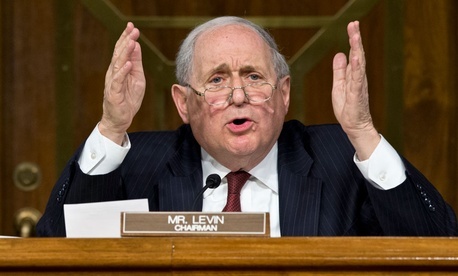 Senate Armed Services Committee Chairman Carl Levin, D-Mich., said he didn’t know if he would support the House payfor and needed to review the details including how he had voted on it previously. Levin said that Democrats generally still preferred a bill without a payfor, and that his personal preference was one that would close off-shore tax havens. The House payfor had received mixed reviews from Senate Republicans Tuesday with many continuing to push for a payfor from New Hampshire Republican Sen. Kelly Ayotte that would close the child tax credit to undocumented immigrants. “I think sequestration was a terrible mistake to start with,” said Arizona Republican Sen. John McCain Wednesday. As Democrats had tested the waters with Republicans over the payfor fight, it had appeared last week that the GOP would balk at even debating a bill that didn’t have a payfor. But Republicans reversed course on Monday joining with Democrats unanimously to take up the Pryor bill, which was left in the dust by Wednesday. In the end, with a snowstorm threat pushing up a looming recess imminently, lawmakers gave up their payfor fights and just wanted to check the box, claim victory and go home. “My inclination is I just want to solve this problem,” said Maine Independent Angus King Wednesday, who had joined in a Democratic press conference decrying attempts to payfor the legislation the previous day.